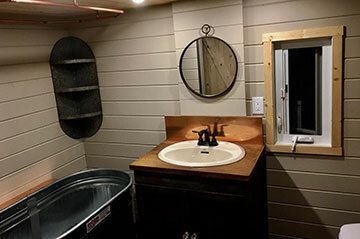 Steve Zaleschuk’s master craftsmanship definitely shows well in this tiny home. Check out our gallery pictures to see the beautiful dark stained cabinetry and feature wall, the cleaver storage solutions and the raised kitchen. This ‘Nottingham’ tiny home is 340 sq ft tiny home (10′ x 28′ x 13.5′) and has been delivered to Vancouver Island. Your Tiny Home is built to your vision so that you are living large in your tiny home! Let FRC build your DREAM tiny home today! Click here to start planning your tiny home.